Kleymenov International Transport Company. A transport company from Stary Oskol, Belgorod Region, in the south of Russia. The skin is for the original Volvo FH460 by SCS. I apologize for the Polish number plates. There is currently no functioning RusMap. 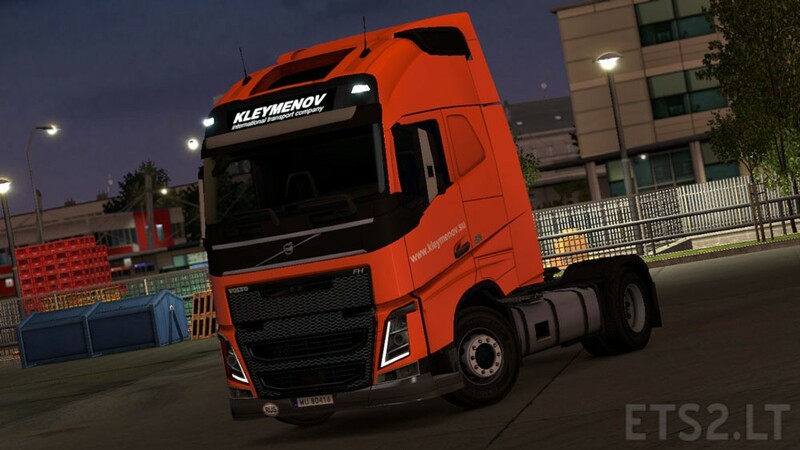 This mod interferes other skin mods for the Volvo FH16 2012 by SCS! DOWNLOADS ON OTHER SITES ARE ILLEGAL AND FORBIDDEN! Respect the authors and KEEP THE ORIGINAL DOWNLOAD LINK! Алексей,я сам из Старого Оскола,белгородской области-пожалуйста обновите ссылку на скачивание,уж больно хочется кататься с данным скином! Заранее спасибо!